U.S. AIR FORCE ACADEMY, Colo. — Clyde Hoffman loves planes. The Colorado Springs sixth grader researches planes, aircraft safety, and airports in his free time, and flies model planes with his dad on the weekends. 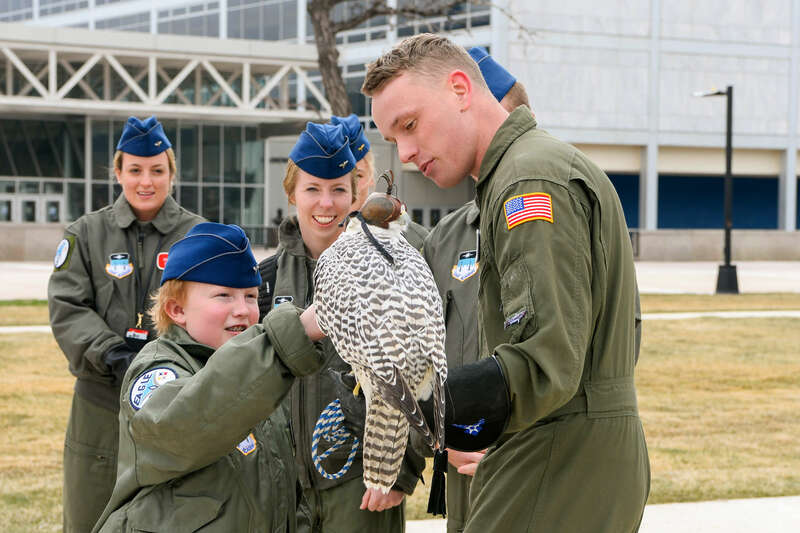 Thanks to a partnership between the Make-A-Wish Foundation and the Air Force Academy, he was the newest Cadet for a Day at the Air Force Academy, April 12. Clyde was born with Alagille syndrome, a rare genetic disorder that can affect the liver, heart, skeleton, eyes and kidneys. The specific symptoms and severity of Alagille syndrome vary greatly. For Clyde, the disorder severely degrades his liver function. Clyde endured a liver transplant from a live donor in 2018. He will take anti-rejection medicine for the rest of his life while dealing with other affects from his disease. Clyde and his family were hosted by cadets from Cadet Squadron 8, who led them on interactive tours of the airfield, fire station, and virtual reality lab before a meet and greet with Ziva, an Academy falcon. Clyde marched with the cadets during their noon meal formation and finished off the afternoon with by learning about the Academy’s unmanned aerial vehicle program. The Academy hosts two Cadets for a Day each semester.